I love my animal print top. It actually was a gift from my mom so many thanks to her! I love the cover up very much. Its very useful and comfy. So yeah, expect to see me wear that a bit more often. And yes, black outfits are the best ever.haha. I know wearing black is playing safe. But nevertheless, it has NEVER failed me. I always feel good when wearing black outfits. And knowing that I look good wearing black makes me feel good about myself which is a feeling that I wanna maintain.. PLUS, these boots are the best ever! Though I wouldn't mind getting an SM PARISIAN flat boots replacement when they come out. (Or have they come out already? I haven't dropped by SM Dept. Store recently). Anyway, my whole PFW SS 2012 experience wouldn't have been possible without the help of certain key persons which I would like to acknowledge and thank here. Thank you Miss Genn D! And I also want to thank Angel from Wonderwomanrises.blogspot.com as well. Though I'm sad though that we weren't able to have a photo together coz I wasn't feeling that well that night so di na ako mashado sumama sa mga picture picture. 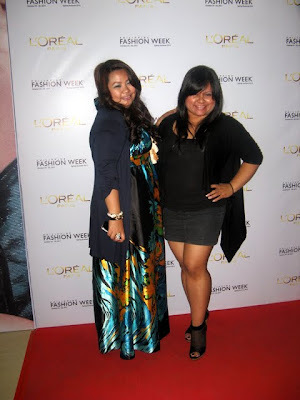 Anyway thank you guys for making my PFW SS 2012 experience memorable! Looking forward to hang out with you all soon..